This page is a companion to the article on the cone 6 glossy G1214W base glaze recipe (which is in turn a derivative of the G1214M). Important information is available on the G1214W article and we suggest you study that page first before reading this one. The spirit of this article is not to produce the perfect matte, it is to talk about how Al2O3:SiO2 chemistry balance in a glaze recipe can be changed to adjust the degree of matteness of a glaze. Generally the best mattes are made using high MgO levels in an otherwise correctly melted base (see linked article on G2934, it is a better glaze). Glossy glazes with a significant amount of boron (e.g. 0.2 or higher) form matte surfaces at a point after complete melting but before smooth-out. In well melted glazes if some oxide amounts are high-end or higher than limits (e.g. CaO over 0.85, SrO over 0.3, BaO over 0.2) a micro-crystal mesh (or skin) can form on the surface during cooling and it scatters light like little prisms. High silica glazes are glossy so it stands to reason that low silica ones with high-end Al2O3 would more likely be matte. Glazes high in alumina tend to form a 'wavy' or 'rippled' micro-surfaces that scatters light. 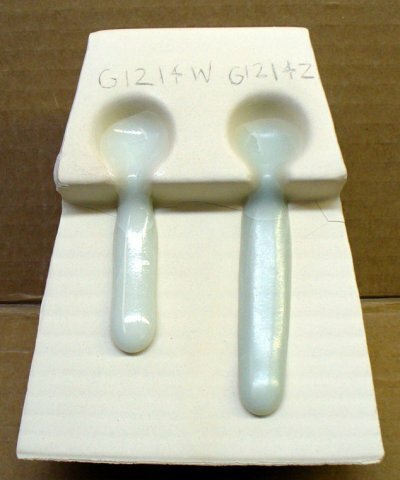 High MgO and medium and high temperatures (0.3 or higher at cone 6 for example) will stiffen a glaze melt without detrimentally affecting glass development. With testing to determine the sweet-spot between cutlery marking and too much gloss, a very silky surface can be achieved. Cone 10R dolomite mattes are a good example of this. Glazes with the proper mineralogy and particle size distribution can melt in a non-homogenous way producing rivulets of fluid glass and islands of stiffer less melted material. The resultant micro-surface is a non-homogeneous mix of different light reflectance and refracting properties. Unfortunately many matte surfaces out there are simply underfired glazes, they are not melted enough. Or, they are melted too much and surface micro-crystallization has gone too far. A true matte has a specific chemistry that does not happen easily by random material blending because the vast majority of materials are silica-dominant and thus by nature produce glossy glazes. In addition, crystal mattes that are discovered by chance often craze on the body. A true matte is one that is both matte and still functional, that is, it is hard, fits the clay body, does not cutlery mark, is resistant to leaching, etc. A true matte will usually fire higher and often still be matte. However, keep in mind that the very fact that a glaze is matte means that it needs to push the limits. A stable glaze should be melted to a smooth surface and not crystallized. Matte glazes are normally neither. The mechanism of cone 6 matte that I will discuss here is often high CaO to encourage micro crystal development. If the CaO is within limits on most glazes they just will not be matte. As implied, mattes by nature tend toward crazing and cutlery marking. Visit a fine dinnerware store and you will see very few matte glazes. If you do take out one of your keys and try to mark the surface and then rub it off and see what happens. It is a fact that even major players in the ceramic industry have, to some extent, depended on customer ignorance regarding matte surfaces. Worse yet, other companies and individual potters themselves are less than knowledgeable about how to formulate and fit a good matte glaze. Matte glazes, especially at cone 6, tend to expose the folly of the prevailing mindset in university and industrial ceramics. People tend to pin their fortunes on the traffic in recipes. However dependence on this traffic spawns helplessness and delivers barium mattes whose safety is surrounded by controversy; crystalline mattes which fire inconsistently, craze and work unpredictably with colors; or improperly melted compounds that are not functional, durable or hard. Most important true high alumina mattes don't travel well because they are inherently volatile, that is, the degree of matteness varies disproportionately with small changes in formulation, firing, body and additions. In fact it is not uncommon for a glaze that fires matte in one kiln to fire glossy in another. To best understand the recipe I recommend starting with a reliable transparent glossy glaze and adjusting it toward matteness. The process of working through this will give you a good understanding, you will see the more difficult matte in terms of the glossy base that you already know. Let us do that now. Here is a glossy base glaze that I have been working with. It is thoroughly dealt with in its own article. See below for a link to this recipe. Eliminated the silica. Why? Alumina matte glazes have high alumina and low silica, thus they have a low silica:alumina ratio in the formula. This one change reduces the ratio from 9:1 to 5:1. While this ratio is a perfect target for matte effects, the change has introduced a problem that illustrates why good matte glazes don't often happen by accident: The thermal expansion INSIGHT calculates sky-rockets almost guaranteeing that it would craze. Eliminated the feldspar. Why? Feldspar contributes lots of sodium oxide (Na2O) and potassium oxide (K2O) and these have by far the highest thermal expansions. This change means that other materials must be employed to restore fluxes, SiO2 and Al2O3 lost by cutting the feldspar. Switched to an alumina-containing boron frit (the one in the starting glaze contains no alumina). I also increased the frit amount enough to take B2O3 up to 0.3, this makes up for the lost K2O and Na2O. Adjusted the kaolin and silica to achieve a low ratio. It is true this recipe has a higher calculated expansion than its glossy parent. However remember that calculated expansions are relative within the same oxide/material/firing system only, I have moved to a glaze with a drastically different balance of oxides. My tests indicate that an expansion of 7.1 for this 'system' is low enough not to craze on any of the 10 or more middle temperature clay bodies I use. It has plenty of EPK, this makes the slurry a dream to use, it goes on silky without any drips. It has a simple recipe. It has a little silica which means I can reduce or increase it over time to fine tune the fired surface. It has enough calcium that it works with chrome-tin colors. It has a very low calculated thermal expansion. Remember, since many colorants are fluxes they have the potential of turning a matte glaze glossy. Thus once you have tuned the base recipe to the amount of matteness you want you need to retune it for each variation (addition of color, opacifier, variegator). In each case we recommend you leach test it (see linked article). You may be wondering why I started with a glossy glaze and adjusted it toward matteness rather than improving an existing matte or starting from scratch. The reason is that I want to be able to rationalize the matte recipe in terms of the glossy and thus better understand the high-alumina matte mechanism. Can you find a way to reduce the CaO, maintain the thermal expansion, and still achieve a silky matte surface. Some users have demonstrated that it is possible to increase the alumina far higher (boron glazes can take a lot of alumina, especially if ball milled well) thus making room for more KNaO while still maintaining a low thermal expansion. However, you can make an even better matte using the MgO mechanism and get a silky surface similar to the classic cone 10 dolomite matte (see the links for more info). Since this recipe has a fairly high kaolin amount (to supply the alumina) it is possible it may shrink excessively and crack during drying. If this happens to you then either use a less plastic kaolin, use a calcined kaolin:raw kaolin mix to reduce drying shrinkage or adjust the formula to supply some of the Al2O3 from other materials so the kaolin amount can be cut. Also, if you are in the habit of putting bentonite in all of your glazes, don't put it in this one; bentonite is only needed in glazes lacking clay materials to suspend and harden them. Alumina mattes have, by nature, a stiff melt with high surface tension. That means the glaze will not 'wet' non-vitreous bodies as well, it will not flow into tight recesses, and when it bubbles they will resist healing or even resist bursting to the point that a pyro-plastic glaze skin swells away from the body and then wrinkles back down during cooling. If your glaze wrinkles we suggest you minimize the amount of added zircon opacifier (these stiffen the glaze further) and use tin oxide instead, cut the Al2O3 a little, use a body with a vitreous surface to bond better with the glaze, and experiment to find a sympathetic firing curve. If the glaze is not properly melted it will be somewhat absorbent and thus will hold stains and be difficult or impossible to clean. To test for this paint ink or a strong dye (i.e. methyline blue) onto the surface and attempt to clean it off. Matte glazes, because they do not flow as much when melted, can exhibit surface imperfections that are sometimes difficult to deal with. Any particulate contaminant that does not dissolve in the glaze melt is a potential source of blisters, pinholes, etc. Likewise bodies containing larger particles that produce gases during firing will disrupt the glaze surface. These problems can be erratic and very frustrating. Thus if you are a production potter or industrial user do not ignore the value of a ball mill. In addition, be sure to mill for an adequate period. Depending on the efficiency of your mill and your tests it may be that you need to mill for 10 hours or more (yes, 10 hours). A ball mill breaks mineral particles down to very small sizes and thus the glaze as a whole melts much better and wets the surface of the glaze more effectively. You will find that a milled version of this glaze will have a more velvety surface and may be more glossy than its unmilled counterpart. Thus it will likely be possible to raise the alumina and silica even higher to get better hardness and lower thermal expansion. True functional mattes have fluid melts, like glossy glazes. They need this in order to develop a hard, non-scratching durable glass. The mechanism of the matte on the right is high Al2O3 (G1214Z), it is actually melting more than the glossy glaze on the left (G1214W).